Book Review: Will Our Generation Speak? Are we as Christians truly being the bright lights, the strong voices of truth, that we should be? The solution for this world’s confusion is not to fix all the surface problems, however devastating and shocking they may be. Neither is the answer found in political or social improvements. The answer is for individual people to be brought to Jesus Christ and discipled. This means that individual Christians–each of us–need to be faithfully sharing the gospel, teaching others what God has taught us, and encouraging our friends to do the same. This quote really sums up the heart of Will Our Generation Speak?. As Christians, we need to share the Good News with those around us. Yes, it is scary. No, we don’t always know what to say. But we still need to do it. From tips for handing out tracts, to suggestions for conquering your fear, Grace works through the different facets of sharing the Gospel with those around us. As soon as I heard that one of the Mally’s had written another book, I knew I wanted to buy it. Grace certainly did not disappoint. Will Our Generation Speak? 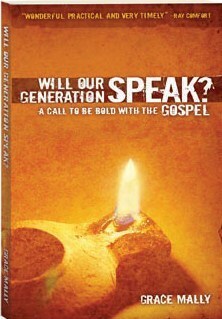 is an excellent book for Christians of all ages, but it is written specifically for young adults. The title of the first chapter says, “Only One Chance to be Young!” As young people, we have the advantage of being less intimidating in our efforts to witness. Grace encourages us to make use of this advantage and not wait any longer to start speaking. One of the biggest lessons I learned from this book is that people are open to the Gospel. When I witness I usually feel like I’m intruding on people, yet Grace tells story after story about how grateful people are to have an opportunity to learn about God and ask questions they’ve been holding inside. If you want to witness more, learn how to witness better or work on conquering your fear, this book is a must read.